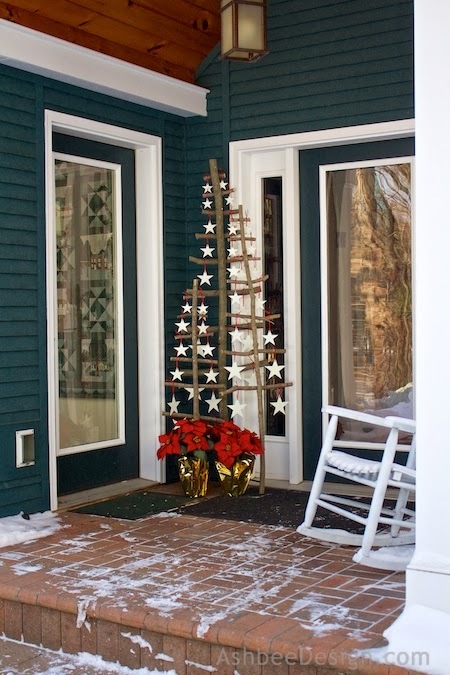 Each year I, like very other blogger, decorate my front door area for the holiday. And I too get over-whelmed with holiday prep. Understand that is not a complaint. To me Christmas is very much a season, a season of prepping, sharing, giving, loving, remembering. I recently read that one way to reduce the stress of the holidays is to view it as a season and not just a day. So true. So because this is a season, several of my holiday posts will be appearing after Christmas Day. I realize I won't inspire you this year, but possibly, you'll find it next year and I'll inspire you then. So, here is your first idea for Christmas 2014! I have a wonderful front portico. 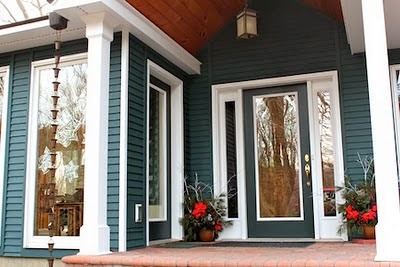 It has entries to both the sunroom and the family room but it is on the north side of the house and has a dark corner. For many years I have made evergreen arrangements for that corner but they get lost in the dark. 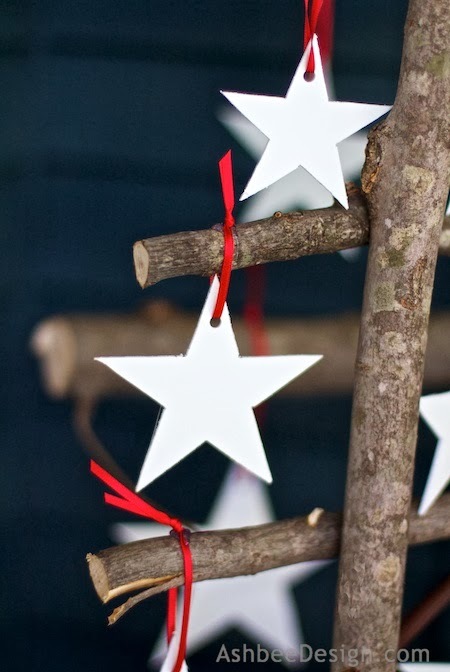 This year I started thinking white stars, lots of them! 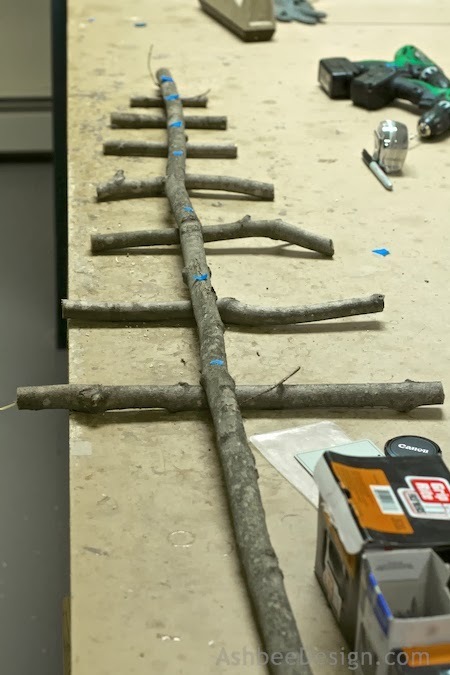 I then built 3 tree forms from saplings on which to display them. These saplings were cut from our property along the roadside where they need to be removed before they impact the power lines above. (That statement is to prevent the comments about how un-green it is of me to cut a live sapling. Many need to be cut!). I choose thin wispy ones about 10-12 feet high. The base became the tree base and then I cut cross pieces, each slightly smaller and thinner from the rest of the tree. I pre-drilled a hole through each and then used drywall screws to attach them to the upright. I made three tree bases in three different sizes. 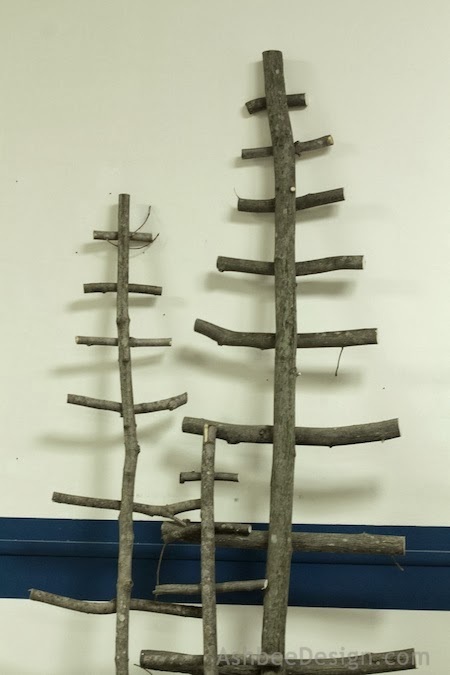 I connected the bases of all three with brown dowels at 2 levels to hold them in a triangular position and to be a self-standing trio of trees. 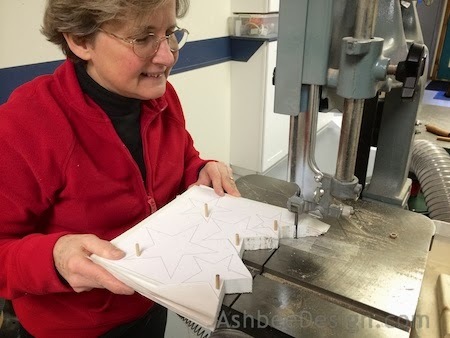 I also stacked some polystyrene and cut out about 75 stars in 4 different sizes with holes drilled in the top of each. 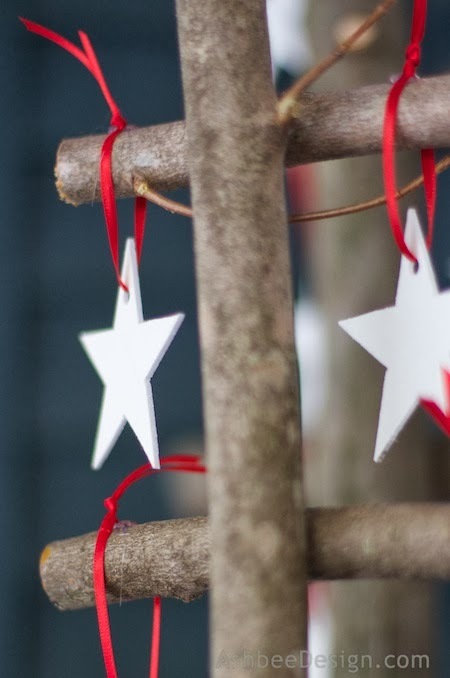 I added a red ribbon and positioned 1 star on each branch of each stick tree. A dab of hot glue holds them in place. 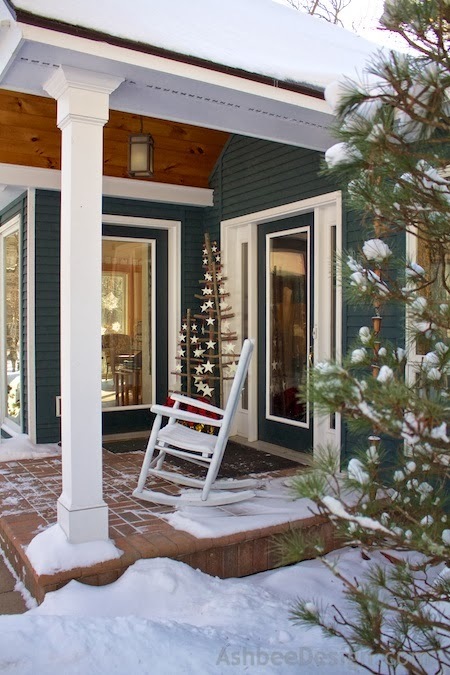 And then placed them in my portico to welcome family and friends to our home this holiday season. 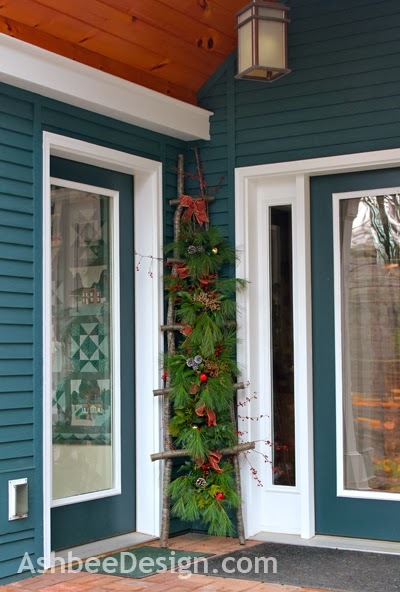 Here is that same corner last year with the Christmas ladder. The ladder was much easier to make but because I had used it for 12 months I needed to try something new. My biggest challenge was how to make them stand-up. 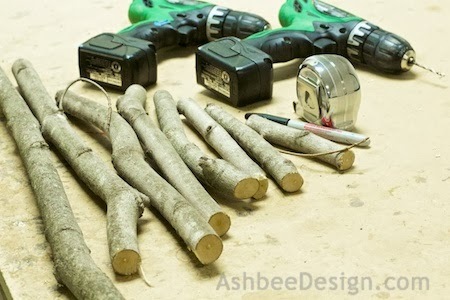 I wanted to stick the uprights into small stumps but we didn't have a big enough drill bit. Took some finagling.